$100 opened up the show. They were a 3 piece band doing the alt country thing. Really the only alt country artist that I listen to is Neko Case, thus it would be very easy for me to make Neko Case comparisons. And I will. The lead singer of $100 actually sorta has some resemblance to Neko. She sings with more of a southern country drawl though. I can't really think of anything else worth mentioning as my interested started to wane after a couple of songs. Like I said, I'm not really into alt-country, though my friend who is, said he enjoyed it. 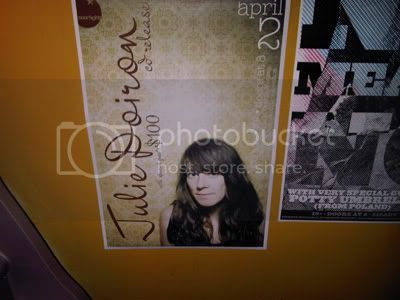 When I was living in Vancouver I had at least a couple of opportunities to see Julie Doiron live, but for some reason or another never got around to. I'm beginning to regret it now. 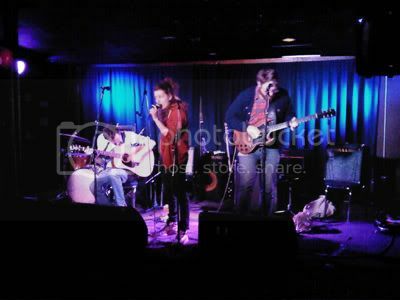 For those not in the loop, Julie is known for playing bass in Eric's Trip, or Canada's version of Sonic Youth. For some of you I realize that I just tried to relate a relatively obscure Canadian artist with another equally obscure Canadian artist. You'll just have to take my word for it that Eric's Trip was an awesome band. For that reason, amongst others, Julie Doiron is (arguably) Canada's reigning Indie Rock Queen and not Feist. Speaking of Feist I recent came across a side by side photo of both Doiron and Feist on flickr that showed some really eerie resemblances. Also they both have an apparent affinity for Vox solid state amplifiers. First off, Julie Doiron is sooooo adorable. Probably the cutest little thing I've ever seen on a stage. Gushing aside, Julie started her set solo playing "Untitled" and "Me and My Friend", which were by her own admission, "sad" songs. She played a couple more and a few requests from the crowd, "Wintermitts" and "Snow Falls in November", before calling for her band to start the full band portion of the night. The whole show had a very loose feel to it. 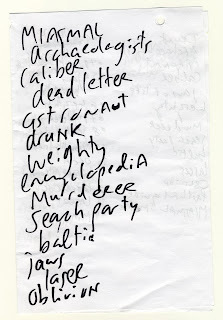 Doiron didn't have a setlist, pretty much playing whatever song felt right at the time. This included songs which weren't even rehearsed. There was even a song, where Julie taught her bassist how to play it moments before it started. Between songs, Julie recalled a really amusing story about drinking wine, or as she called it 'diet alcohol', in her home province of New Brunswick. Highlights for this reviewer were "Consolation Prize", a new one from her just released album and "Nice to Come Home", which she played while the bassist was sorting out a problem with his amp. After almost 90 min of playing and chatting, she ended her set solo with "Glad to be Alive," also from her new album, which was quite the happy and upbeat song and pretty much the perfect song to end the day with. It's been a wild couple of days following Wintersleep around the northwest. These last two Vancouver Commodore Ballroom shows marked the end of this leg of the tour, but also as I eventually found out the probably the last North American show before they head back to recording a new album Welcome to the Night Sky. In some ways, the last little run of shows really summed up the progression that the band has made in the past number of years; from small intimate gigs to sold out Commodore shows. Unfortunately got to the venue late and was unable to catch An Horse's set. I was told by my friend that their set was really good and that they really endeared themselves, as they have been all tour, to the Vancouver crowd. I was able to catch Johnny and the Moon's set. Featuring Dante de Caro of Wolf Parade, and formerly of Hot Hot Heat, they played what I can only describe as something in the folk/indie/bluegrass range. They garnered little interest from the crowd and really didn't do it for me. I guess I was hoping for something more along the lines of what Wolf Parade does. Wintersleep was up soon enough and once again they were in fine form. The show was actually pretty similar to the last time they played the Commodore, and yet, there were still plenty of surprises to keep people interested. The entire latest album was played, but some older tracks, "Jaws of Life" and "Caliber" were still also inserted in. I should also mention that the new songs, tentatively named "Baltic" and "Encyclopedia" are really starting to grow on me. "Encyclopedia" in particular could probably make it as a single with it's slight hook and chorus. After a quick encore break, the band returned for a 3 song encore that included the semi-rarely played "Assembly Lines" from their first album. Closing the show was a relatively shorter version of "Danse Macabre". Unfortunately there was no extended jam. The crowd seemed pretty happy however nonetheless. An Horse played a little longer than last night. 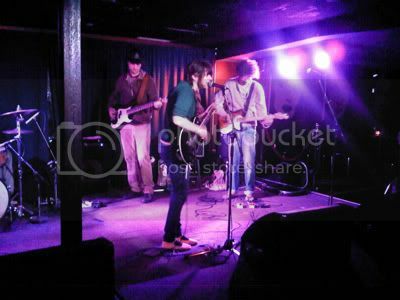 Despite the longer set, they seemed to rush through their set, dispensing with their usual cheerful banter. Night 2 for Wintersleep was pretty similar to the night before. There were a couple of differences. Night 1 seemed to have little more (for lack of better words) flow to it. Don't get me wrong, both were great sets, but the first night was probably the better of the two. In terms of song selection, the encores were mixed up a little bit. 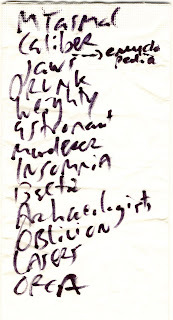 Most notably, "Assembly Lines" and "Danse Macabre" on night 1 with Neil Young's "Words" and Nerves for night two. Their cover of "Words" really brought chills down my spine. "Nerves Normal, Breathe Normal" was pretty standard Wintersleep with the usual killer drumming by Loel. Afterwards hung out with the band (who are very down to earth I might add) a little bit and enjoyed some very nice scotch. Finally big thanks to the band, Chris (their tour manager), Adrian and Mark for all the good times.